(New York, April 29, 2015) – Iran’s intelligence and security forces have rounded up and detained scores of Ahwazi Arabs, including several children, in what appears to be an escalating crackdown in Iran’s Khuzestan province, Amnesty International and Human Rights Watch said today. For more details on the 2015 protests and arrests, a list of those arrested, and background on the 2005 protests, please see below.
" 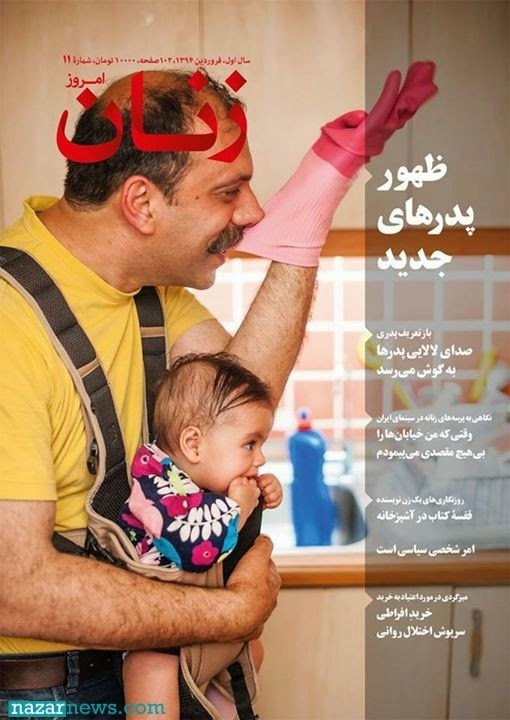 Zanan Emrooz " Monthly Women Magazine is Banned From Publication ! On Monday the " Zanan Emrooz " Monthly Magazine is banned by Media Watch Dogs from publication because of a published article known as " White Wedding" or Ezdewaje Sefid" . Zanan Emrooz is managed by Ms. Shahla Sherkat and is focuses on women issues and does not have any affiliation with any political group or party's. In the past this magazine was banned from publication for seven years and recently resumed its publication. - We can't tolerate the 712,000 Tuman monthly wages , because the apartment rent is 3,500,000 Tuman. 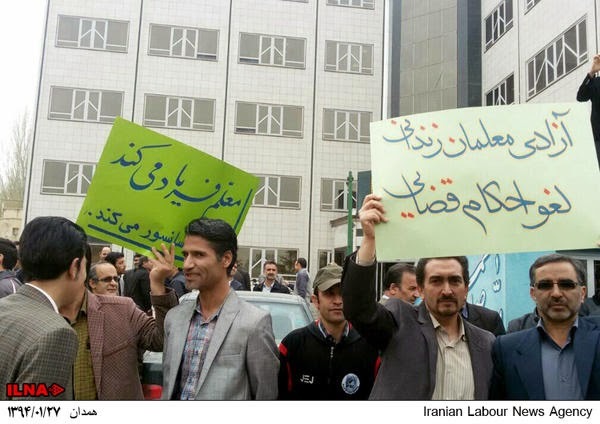 - Remove the prison sentencing of Jamil Mohammadi and Jafar Azimzadeh both coordinator of 40,000 petition for wage increase . In the protest retired teachers also joined workers and chanted for a better living condition . KARACHI, Pakistan (AP) — Gunmen on a motorcycle killed a prominent women's rights activist in Pakistan just hours after she held a forum on the country's restive Baluchistan region, home to a long-running insurgency, police said Saturday. 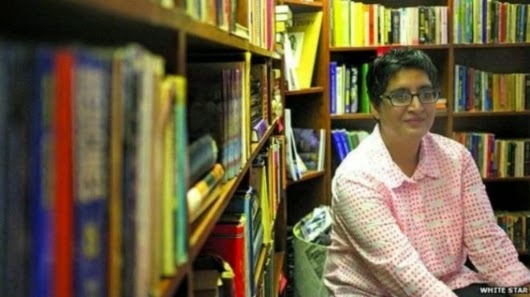 While investigators declined to speculate on a motive for the killing of Sabeen Mehmud, friends and colleagues immediately described her death as a targeted assassination in Pakistan, a country with a nascent democracy where the military and intelligence services still hold tremendous sway. 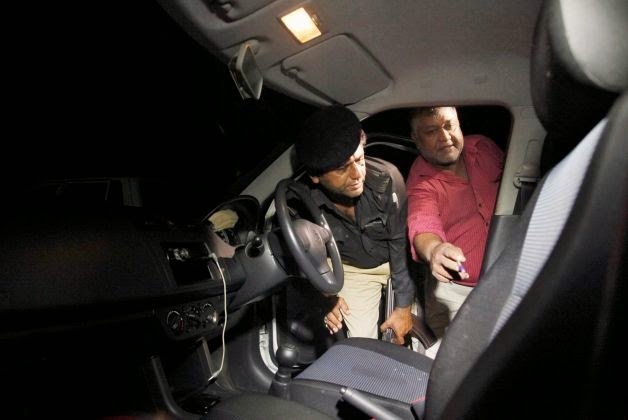 The gunmen shot both Mehmud and her mother, Mehnaz Mehmud, as they stopped at a traffic light Friday night in an upscale Karachi neighborhood, senior police officer Zafar Iqbal said. Later, journalists saw their car at a nearby police station, the front driver's side window smashed out and a pair of sandals on the floorboard, broken glass all around them. Blood stained the car's white body. "Two men riding a motorcycle opened fire on the car," Iqbal said. Mehmud "died on her way to the hospital. Her mother was also wounded." Alia Chughtai, a close friend of Mehmud, told The Associated Press that Mehmud was driving at the time of attack and her mother was sitting next to her. Chughtai said Mehmud's driver, who escaped unharmed, was sitting in the back seat at the time of the attack. She said she did not know why the driver wasn't driving the car. Iqbal and other police officials declined to offer a motive for the slaying. However, earlier that night, Mahmud hosted an event at her organization called The Second Floor to discuss human rights in Baluchistan, an impoverished but resource-rich southwestern province bordering Iran. Thousands of people have disappeared from the province in recent years amid a government crackdown on nationalists and insurgent groups there. Activists blame the government for the disappearances, something authorities deny. Qadeer Baluch, an activist who last year led a nearly 3,000-kilometer (1,900-mile) protest march across Pakistan to demand justice for the missing in Baluchistan, attended Mehmud's event Friday night. Baluch, known widely as Mama or "Uncle" in Urdu, hinted that the government could be involved in Mehmud's slaying. "Everybody knows who killed her and why," Baluch told Pakistan's The Nation newspaper, without elaborating. In a statement Saturday, Prime Minister Nawaz Sharif condemned Mehmud's killing and ordered an investigation into the attack. The U.S. Embassy in Islamabad also condemned Mehmud's slaying and offered condolences to her loved ones. Mehmud was "a courageous voice of the Pakistani people and her death represents a great loss," it said. Mahmud, a well-known activist who also ran a small tech company, hosted poetry readings, computer workshops and other events at The Second Floor. She continued to live in Karachi, Pakistan's southern port city, even while acknowledging the danger from insurgent groups and criminals operating there. "Fear is just a line in your head," Mahmud told Wired magazine in 2013. "You can choose what side of that line you want to be on." Mohammad Reza Alipayam the Iranian Satirical poet and critic was summoned to Evin prison on Wednesday at 2:00pm to spend a One year and Three Months Sentencing which was ordered against him by Judge Pirabbasi at Branch # 26 of the court of revolution. 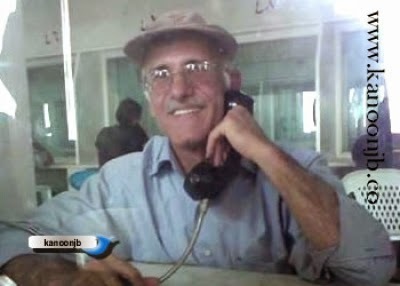 Here Mr.Alipayam is letting us know that he is going to Evin prison for One year and three months just because of his one poem . He is sentenced two times for one poem , he says: for one poem, how many times i should be sentenced? 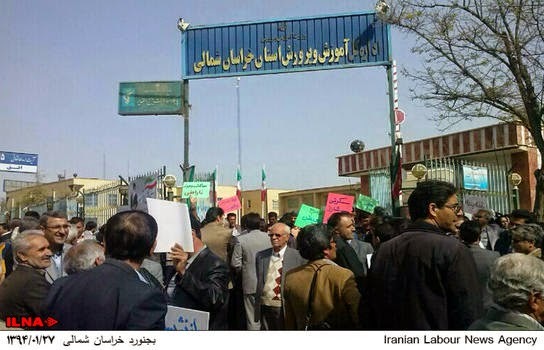 The Cenral Council of the Teachers Organization in Iran is Calling All Teachers for Yet Another Day of Action on Teachers Week ( May 7 ) ! 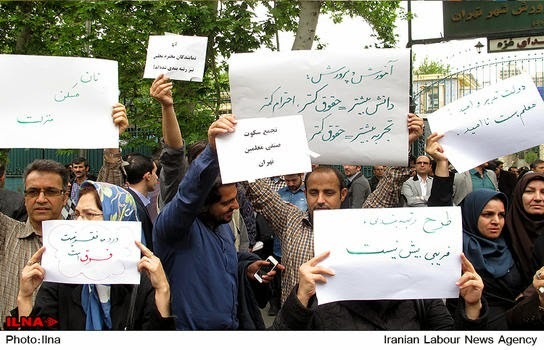 According to news coming from Iran ,The central council of Iran teachers organization is calling yet for another day of action on Thursday May 7 ( the national day of teacher) . 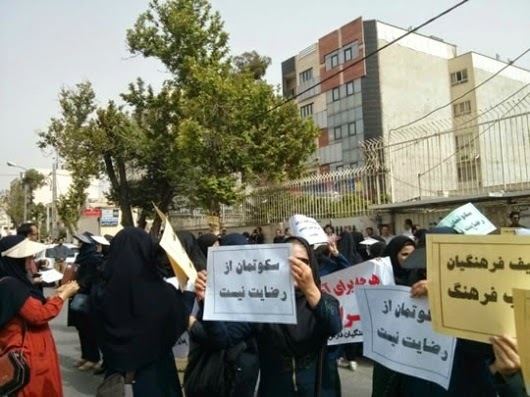 20 months has passed since the Government of president Rohani took office but nothing has changed for teachers deteriorating living condition. 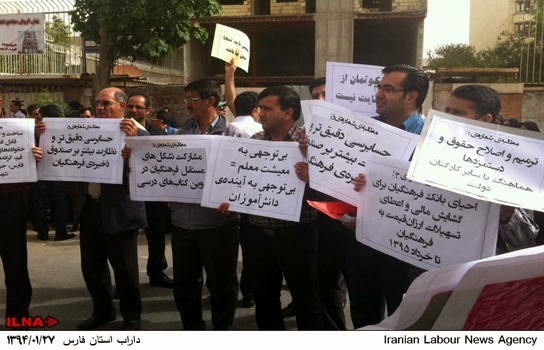 The central council of teachers organization in a letter to president Rohani reminded him about his election promises. 3- Release their colleagues from prison. 4- The presence of two representative from teachers council among president representative for looking into the teachers demands. 5- Execution of article 30 of the constitution. 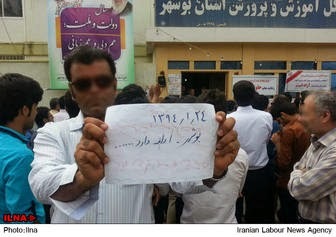 The General Secretary of The Iranian Teachers Organization is Arrested ! According to news from ILNA , on Sunday morning Mr. Alireza Hashemi the general secretary of Iran's Teachers Organization is arrested . His arrest is based on a sentence against him from 2009 which was suspended or delayed . He is charged is based on his advocacy on teachers rights and his meeting with the family's of those imprisoned teachers . He was sentenced to five years imprisonment. Wave of Workers Protest continues Almost Daily.......And The Reason, The Worsening Living Condition ! 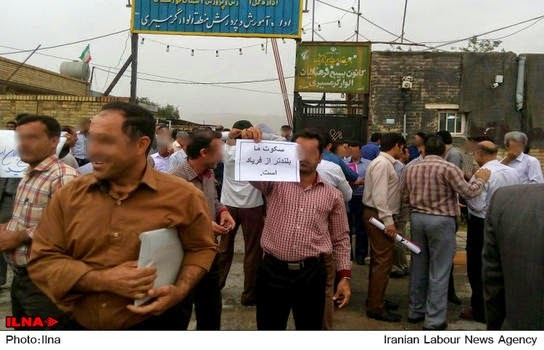 Every day there are tens of strike or protest by Iranian workers and that is because of the worsening living condition , Delay in monthly salaries , factory closures , imprisonment of labor leaders and many other issues. 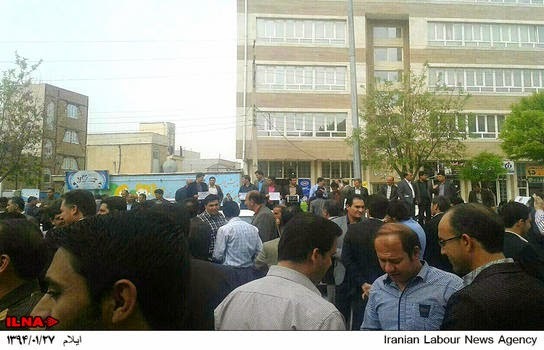 1- Workers at " Navard Louleh Safa " has gone into the strike since last Sunday . 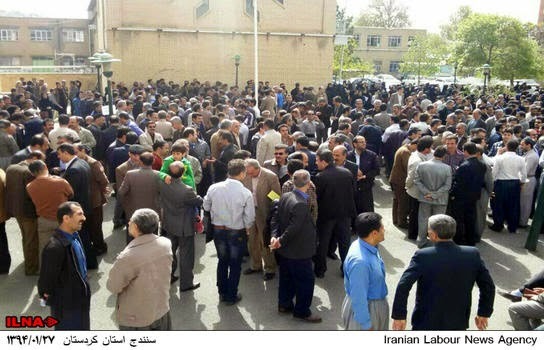 2- 600 workers of Energy Power Plant from all over the country gathered in front of the President office . The reason for this protest is because the working situation of 5000 workers isn't fixed . 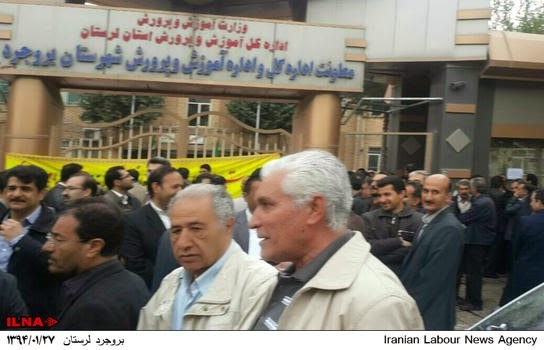 3- Close to 300 Workers from power plant in the city of Tabriz gathered in front of the regional power plant building on Sunday and protested against the privatization . 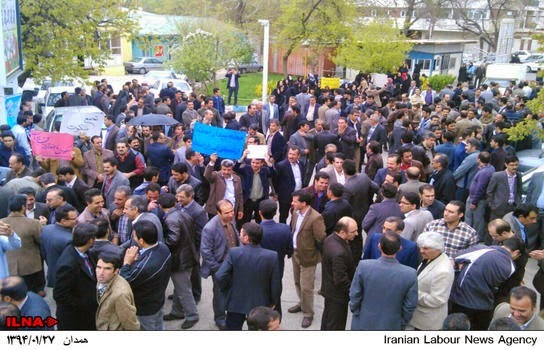 4- 270 workers from " Machin Alat Sanati " For tractors making gathered on Sunday in front of the governors office and demanded their delayed salaries be paid . The workers sat on the asphalt of the street and prevented the traffic from flowing . 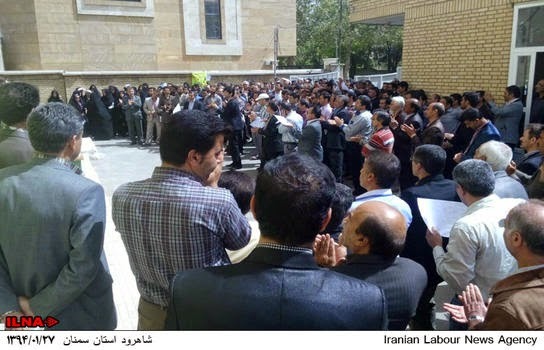 5- Workers from Isfahan Petro -Chemical gathered on Sunday in front of the Parliament in protest against the privatization and their contract situation . 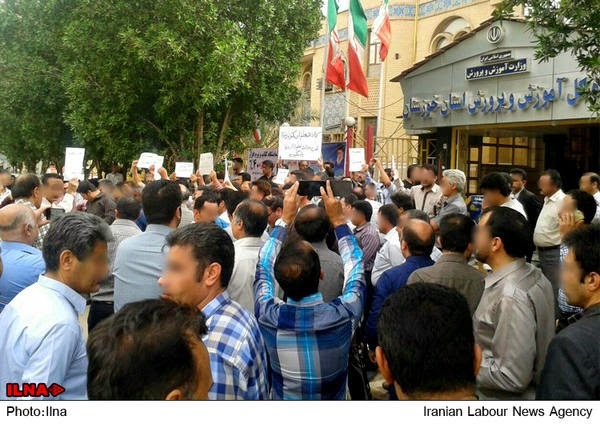 Is Iranian working class going to be the major force behind the future protest ? Five More Prisoners Are Hanged Inside Islamic Regime's Prison ! According to the International Committee against execution , early this morning five more prisoners are hanged inside Karaj Central Prison. These prisoners were charged with drug trafficking and sexual assault . In recent weeks fifty prisoners were hanged in three different prisons : Ghazal Hesar, Karaj Central prison and Rejaei Shahr prison. (Sydney, April 16, 2015) – Australian Foreign Minister Julie Bishop should raise human rights concerns with senior Iranian officials during her visit to Tehran on April 18, 2015, Human Rights Watch said in a letter to the foreign minister released today. Bishop is the first senior figure in the Australian government to visit Iran in more than a decade. Bishop should press the government of President Hassan Rouhani to end widespread restrictions on freedom of expression and association, persecution of ethnic and religious minorities, discrimination against women, and the alarming rate of executions, including of child offenders. Bishop is likely to ask Iran to take back failed asylum seekers, following an April 11 statement by the Australian Prime Minister Tony Abbott who told reporters “we’ll be talking to the Iranian government about taking back people who are Iranian citizens, because they deserve to be in Iran.” In 2012-2013, at least 70 percent of Iranians claiming asylum in Australia were determined to be legitimate refugees. Bishop should press Iranian officials to address the violations that compel people to flee Iran and to seek protection elsewhere, Human Rights Watch said. Iranian security forces arrested several thousand protesters, political opposition members, and activists following the disputed 2009 presidential election. Rouhani won the presidency in the subsequent presidential election, in 2013. 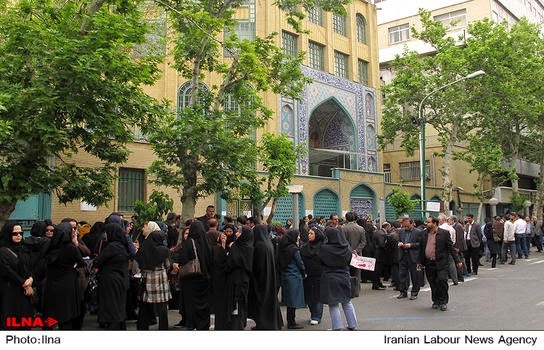 But scores of those detained in 2009 remain locked up or under house arrest, including the former opposition figures and presidential candidates Mir Hossein Mousavi and Mehdi Karroubi. Iran has also has among the world’s highest numbers of journalists and social media activists in prison. 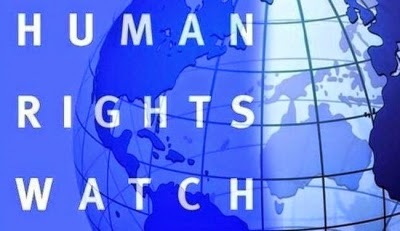 Bishop should also raise the issue of the death penalty with Iranian officials, Human Rights Watch said. In 2014, Iran carried out the second-highest number of executions of any country in the world, exceeded only by China. Nearly half were on drug-related charges. At least 14 were child offenders, according to Amnesty International, making Iran the country with the world’s highest number of executions of people who committed crimes when they were children. “After her strong statements against the death penalty in Indonesia, Bishop should use her Tehran visit to show that the government has a consistent, principled position by calling for a halt to Iran’s seemingly insatiable appetite for executions,” Pearson said. 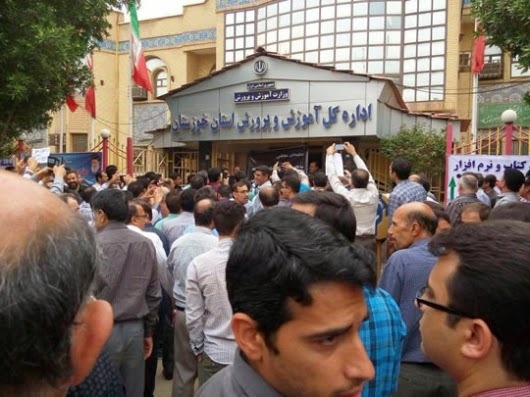 Thousands of Iranian Teachers from All Over Iran Protest in a Silent Gathering .............They Have Demanded for the release of their Imprisoned Colleagues , An End to Discrimination and For A better Living Condition ! 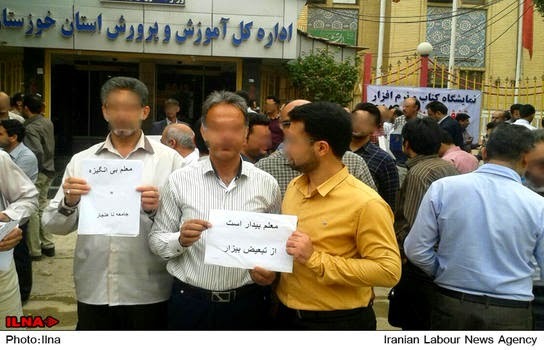 Thousands of Iranian Teachers from all over Iran today Thursday protested in a Silent Gathering and demanded for the release of their imprisoned colleagues , an end to discrimination and for a better living condition. 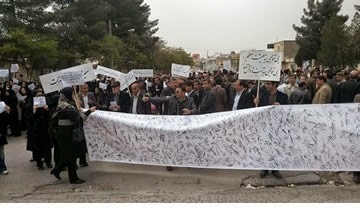 Teachers from almost every city's in Iran joined the protest today. 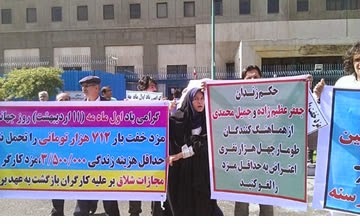 Teachers From All Over Iran Protested ..........Will Iran Face Major Protest in The Coming Years ? 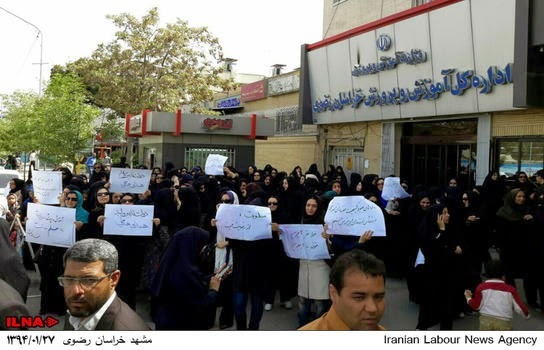 Teachers from all over Iran protested in front of the ministry of education in their city's over what they call discrimination, low living condition and for the freedom of their Teachers Union leaders from prisons cells. Kermanshah, Karaj, Saveh, Isfahan, Hamadan, Sanandaj, Shiraz, Marivan , Khoramabad, Zanjan, Yazd, Aligodarz, Khodabandeh, Bojnourd, Ghazvin, Zahedan, Oroumieh, Darab, Ghom, Abhar, Kerman, Arak, Paveh, Hormozgan, Bandar Abbas, Kamiyaran, Tehran, Ilam and many more city's around the country . Islamic Regime in Iran Hanged 34 Prisoners in Just 3 Days ! 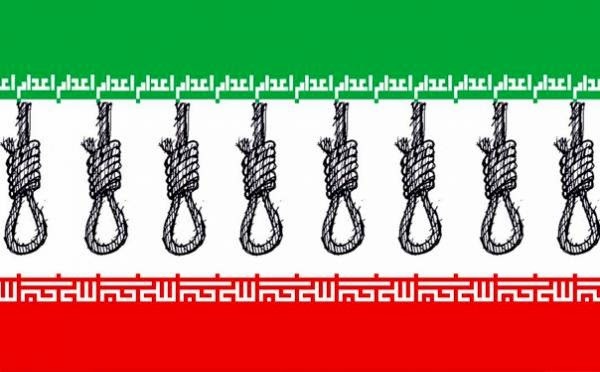 According to International Committee Against execution just in three days from Last Sunday to Tuesday 34 prisoners were hanged by Islamic regime in Iran prisons. These executions happened in three prison : Ghazalhesar prison , Rejaei Shahr Prison and Karaj Central Prison. The names of eight prisoners were not released but the rest are available and all these prisoners were drug dealers . 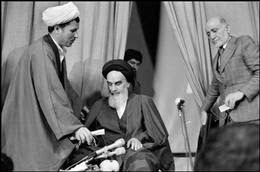 Ayatollah Hashemi Rafsanjani : The Presence Of Cruelty and Violent behavior Against Prisoners Inside Prisons ! That is what Ayatollah Hashemi Rafsanjani the right hand man of the founder of the Islamic Republic Ayatollah Khomeini said recently which brought anger among the ISIS and Taleban Style Iranian fundamentalists Islamists circle and even caused the commander of Sepah, Mr. Jafari to react on that. 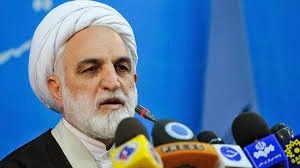 Mr. Ejeie the spokesperson for the judiciary power also in his 77th press conference session commented on what Ayatollah Hashemi Rafsanjani said about prison situation in Iran , Mr. Ejei said: "If what has said , not proven , it can be categorized as accusation and creation of public disturbance ." What Ayatollah Hashemi Rafsanjani said about prison and prisoners situation in Iran , have been said for years under this Islamic Regime by political prisoners and human rights organization in and around the world . Iran has reacted angrily to a European parliament resolution calling on diplomats to shine a spotlight on human rights in their negotiations with Tehran as part of a new strategy towards the country. Iran's foreign ministry summoned the Greek ambassador on Sunday in protest at the resolution, passed by MEPs in a plenary session last week, which condemned the Islamic republic's record for "continued, systematic violation of fundamental rights". Greece currently holds the rotating presidency of the EU. Foreign minister Mohammad Javad Zarif, who spoke to members of the Iranian parliament Majlis at the weekend, dismissed it and said the EU parliament was "not in a position, nor has the moral authority" to take such measures against his country. to declare a moratorium on the death penalty. The resolution reflects the parliament's view but does not have legislative force. during her first visit to Iran as the EU foreign policy chief. The new resolution has come ahead of a new round of talks between Iran and six world powers on a comprehensive agreement that could potentially settle a decades-long dispute over Tehran's nuclear programme. Negotiations are due to kick off in Vienna on Tuesday. Ashton, who acts as a convenor for the six world powers in the nuclear talks, came under attack for raising human rights concerns in Tehran but enjoys relative leeway among Iranians in comparison to other western politicians after she brokered the interim nuclear deal with Iran last year. In his comments to Iranian MPs, Zarif said Tehran could not accept EU's "conditions" and will block any visit to Iran meant to happen under the resolution's criteria. The foreign minister also said the human rights accusations were fabricated by groups close to "Zionists". Last week's resolution commended President Hassan Rouhani's administration for a series of improvements on human rights, including the release of prominent lawyer Nasrin Sotoudeh, but called on the Iranian authorities to release all remaining prisoners of conscience including trade unionists, labour activists and those jailed after the disputed presidential election in 2009. 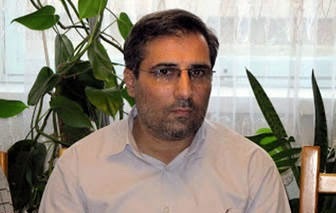 The EU also urged Tehran to allow the UN special rapporteur for the situation of human rights in Iran, Ahmed Shaheed, to visit the country. On the nuclear issue, the European parliament welcomed the interim agreement, sealed last year in Geneva, and called on all parties "to engage constructively in the negotiating process so that the final comprehensive agreement can be concluded within the agreed time frame". A number of senior Iranian officials echoed Zarif in dismissing the EU's decision, interpreting it as meddling in Iranian internal affairs. Ali Akbar Velayati, a senior adviser to the Iranian supreme leader, Ayatollah Ali Khamenei, said it was a "pressure tool" and accusations were groundless, according to the state-run Press TV. "These kinds of unjust and groundless judgments are of no value to the Iranian nation," he said. Ali Larijani, the speaker of Majlis, said the EU resolution was politically motivated. "As a matter of fact, this resolution is nothing more than a political statement in terms of the method used for compiling the contents to show the European parliament's symbolic position, which has no executive power," he said, according to the semi-official Fars news agency. 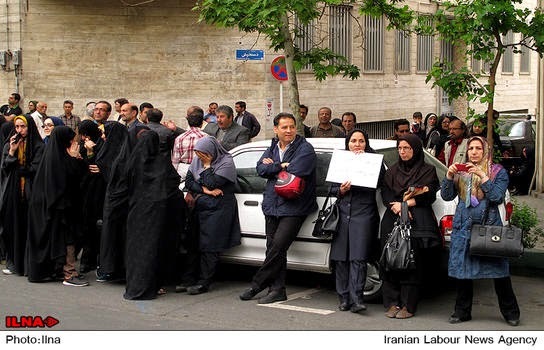 The foreign ministry spokeswoman, Marzieh Afkham, also called it "unfounded and unacceptable", Fars said. A group of Iranian MPs said they would retaliate by passing a bill requiring the government to take fingerprints of any EU delegation visiting Tehran. Mohammad Ali Movahedi Kermani, the Friday's prayer imam, accused the EU of spreading "homosexuality" after the resolution slammed Iran for discrimination on the basis of sexual orientation. 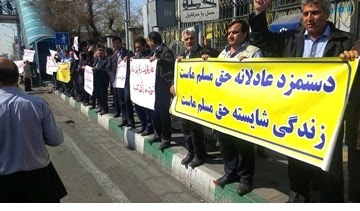 Teachers From Khouzestan Province Protest ! 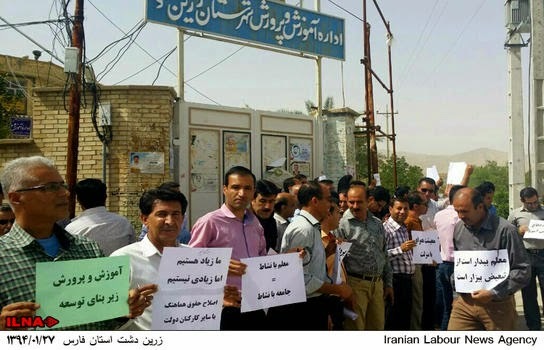 According to news , on Sunday 12 April Teachers from the city of Ahwaz in Khouzestan province gathered in front of the Ministry of Education office and called for increase in their salary and better living condition. 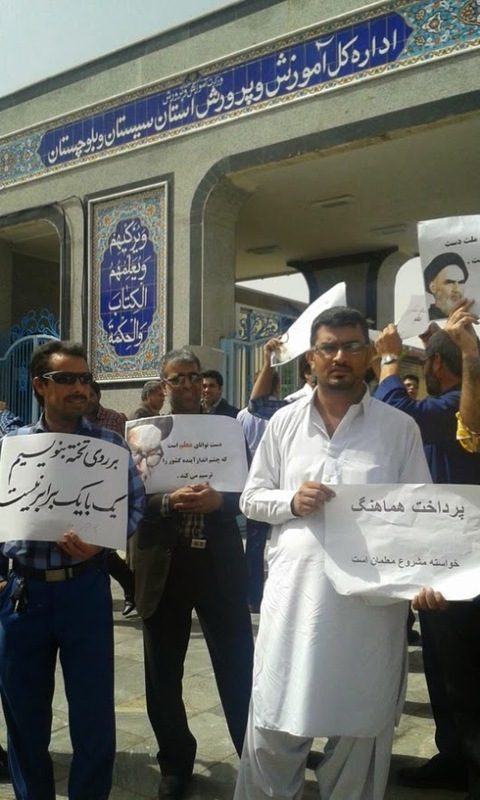 Other area in Khouzestan including Andimeshk and Alwar also rallied in front of the ministry of education for a better living condition. These protests are the continuation of series of protest by teachers from last winter . 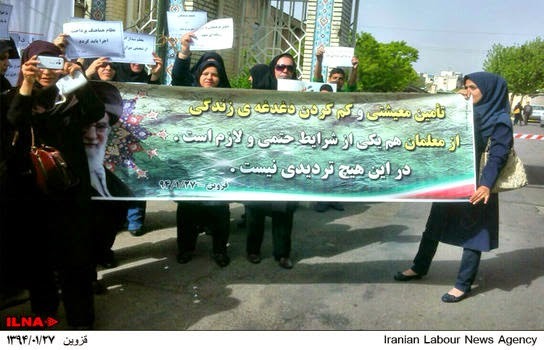 Also, a group of teachers in a statement called all teachers in Iran for a day of action on Thursday April 16. The Islamic Republic of Iran has been falling in the index since 2003 and moderate conservative Hassan Rouhani’s installation as president in June 2013 has not had a positive impact on freedom of information. The authorities have closed newly-created news outlets and, with the active cooperation of a judicial system controlled by the Supreme Leader, the Revolutionary Guards have orchestrated a wave of arrests resembling the one unleashed five years earlier after President Mahmoud Ahmadinejad’s disputed reelection. The Rouhani administration has played a role in the arrests as a silent accomplice. Iran continues to be one of the world’s five biggest prisons for news and information providers, with 50 journalists and netizens currently detained. In 2014, no journalists and no net-citizens were killed. Note: “Journalists killed” in the table includes only cases in which Reporters Without Borders has clearly established that the victim was killed because of his/her activities as a journalist. It does not include cases in which the motives were not related to the victim’s work or in which a link has not yet been confirmed. MP Motahari : It Is Clear From Where Those Attackers Were Organized ! 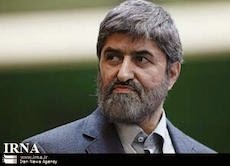 Recently Ali Motahari a moderate MP was attacked by a group of fundamentalist Islamists in the city of Shiraz . Mr. Motahari was there for an invitation by University of Shiraz to deliver a speech but were attacked and the Taxi which was carrying him was smashed and the angry attackers were armed with clubs, sticks and tomato charged at him and did not allow him to reach to the university . 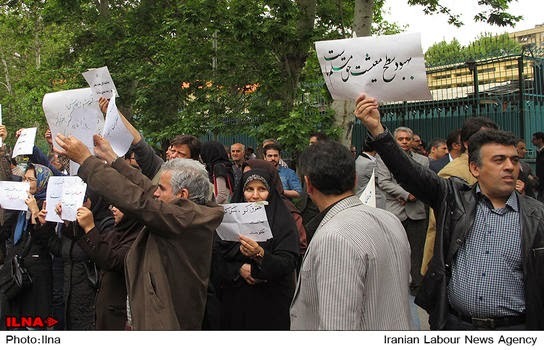 On that issue, Mr. Motahari said , it is clear from where those attackers were organized. Therefore , the explanation of some of the security council is confusing , they say, there is no security , but people who are working under their supervision are the one violating the security . 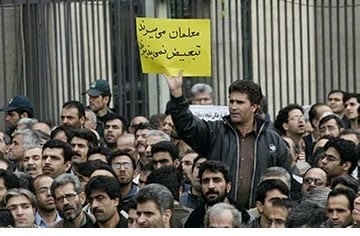 Mr. Motahari says : Well, come and manage it and don't let it happen . The duties of security council is to bring safety / security not to violate the security and to cancel my program in university. Although some of the attackers were arrested but released later on bail , Mr. Motahari says, some of the executive officials of the province are also in the list of accused . It is believed that ,the report of this incident is going to be send to president for his recommendations. 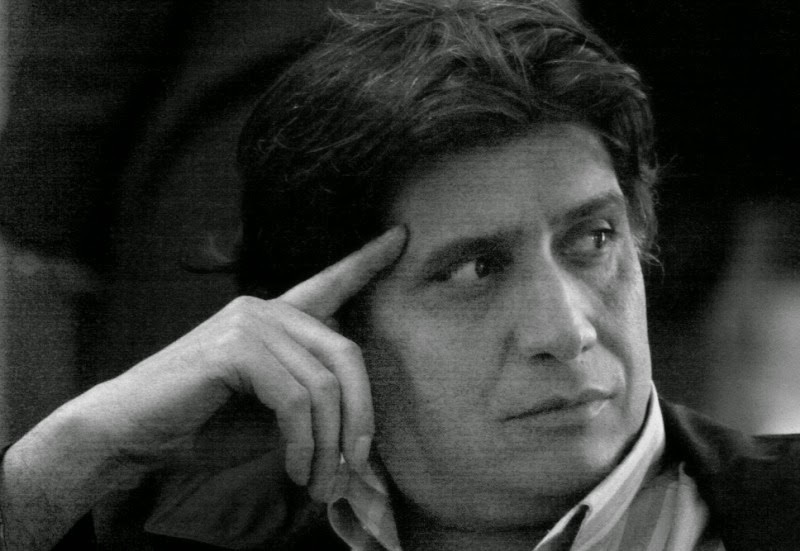 HRANA : Mostafa Azizi will go On Trial in June ! Mostafa Azizi the Iranian writer and film maker who is a resident of Canada will go on trial in June. Mr. Azizi has already spent two months in Evin prison. Mr. Mostafa Azizi is charged with propagating against the regime and insulting the leader of the Islamic Republic and the founder of the regime in Iran . He will be brought to branch number 15 of the court of revolution for trial under judge Salavati. According to HRANA and based on information from sources , there is no possibility for his release by bail. Mr. Azizi is a resident of Canada and returned to Iran to visit his family and was arrested a month later by security forces. Sepah (Revolutionary Guards) Attacked Ward 350 In Evin Prison again ! After some kind of agreement on nuclear energy between Iran and 5 other countries just few days ago, human rights advocates called president Rohani to improve the human rights situation , but now we see again that Sepah forces attacking ward 350 in Evin prison and hurting or threatening the life of nearly 40 political prisoners. 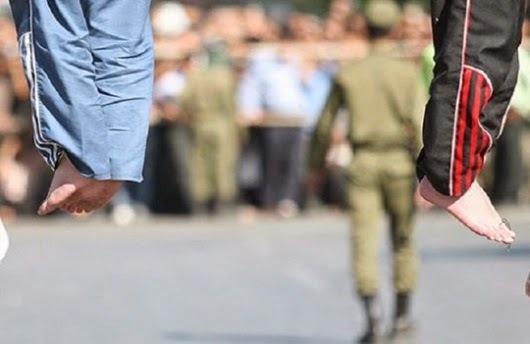 There are news that, on Sunday the forces of Sepah and prison guards together with agents from ministry of information making same kind of attack ( did one last year ) on political prisoner in ward 350 where 40 political prisoners are being held there. Regime does these attacks on political prisoners as a pretext to search the ward and the prisoners belongings. Doctor Mohammad Maleki The First Head of University of Tehran After The Revolution and A human Rights Defender :As I followed Before and After the Nuclear Agreement , The Most Important Things For The Countries Who have Come to this Agreement Is the Economic Opportunities and we have less heard they would talk about human rights or the rights of people. In the nights during the agreement no one touched the issues of human rights. This regime would never go towards the issue of peoples rights and this means they would never officially recognize the human rights . He believes the people themselves must continue their struggle on civil and human rights . 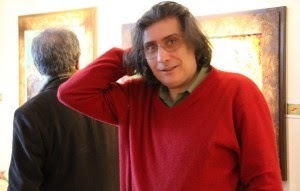 After years of living in Toronto as a permanent Canadian resident, author and TV producer Mostafa Azizi moved back to Iran in January 2015. 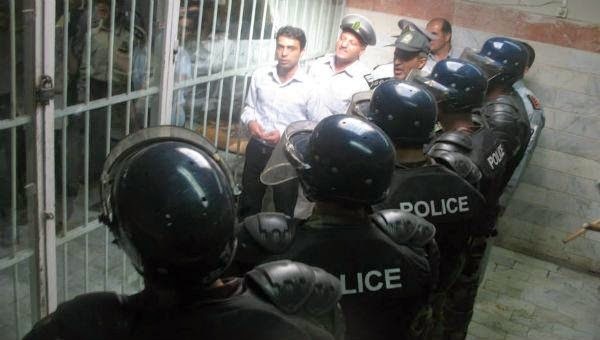 On February 1, he was arrested and put in solitary confinement at the country's infamous Evin prison. Next he was moved to the IRGC-controlled Ward 2-A, until finally being transferred to the lower-security Ward 8, Unit 7, in March. According to an anonymous source published in Human Rights Activists News Agency, Azizi has been charged with “insulting the supreme leader”, “affronting the founder of the Islamic revolution”, “propagandizing against the regime”, and “conspiracy against the regime” and “public order”. Prior to emigrating to Canada, Azizi produced educational and scientific programs for Iranian National Radio, until moving into television as the director of the Computer Animation Unit of the country's national broadcaster, the Islamic Republic of Iran Broadcasting. He moved to Canada in 2009, where he was a prominent cultural figure in Toronto's Iranian community. He founded Alternate Dream Productions, and hosted a centre called Farhang Khaneh (House of Culture) which became a centre for cultural events, such as script writing workshops and film screenings. Iran is known for monitoring politically sensitive content on social media, which is supposedly where police collected their incriminating evidence against Azizi. The IRGC recently announced the implementation of a new surveillance operation known as “Ankaboot” (Spider) that intends to monitor Facebook pages for “corruption” and Western-inspired lifestyles. This program has played a role in several recent arrests, though similar police work was not uncommon before the launch of “Ankaboot”. In July 2014, eight Facebook users were sentenced to a combined 127 years in prison for their activity on Facebook, which the authorities said “acted against national security, spread propaganda against the establishment, insulted the sacred, and insulted the heads of the Islamic Republic”. Azizi has since disabled his social media accounts and websites. His son told us the government had created an archive of his posts from while he was active.